It by Stephen King is more than 1,000 pages and very detailed; set in Derry, Maine, (a fictional town) evil lurks beneath the city streets and in the sewers. This novel has everything readers are looking for in a book: family drama, coming of age story, friendship, an evil clown that is much more sinister than he looks, mysticism, a highly detailed world, and triumph. The main characters are young kids — six boys and one girl — who are the misfits in school for one reason or another and whose families are loving for the most part, though there are a few with messed up parents. The town is at the center of a rash of child killings and the killer is still on the loose in 1958, and their parents and the town adopt a strict curfew. Bill, however, is the most touched by It when his brother is killed by the silver-suited clown with orange pom-pom buttons, and his family begins to pull away from one another, leaving Bill to blame himself. The kids — Ben, Bill, Richie, Mike, Eddie, Stan, and Beverly — join together to form the Losers club and stand up against the town bully, Henry Bowers and his cronies on more than one occasion. Readers are left in the dark as to how the gang gets rid of It until the very last 200 pages, but it is worth the wait as King allows his readers to get to know each character so well that they become friends. Readers feel like they are part of the gang, and they begin imagining their worst nightmares come to life when It arises from the sewers to take another child or to taunt the Losers. King is adept at handling seven major characters and showing readers facets of their personalities and back stories like no other author. His prose is not flowery and is very straightforward, but he captures the emotions and thoughts of all of his characters well, making them vivid and real. In a world where evil lurks to strike at any moment and without warning, readers are taken on a Herculean journey in which seven children believe that they are the only ones capable of stopping It from destroying more families’ lives and taking the town down. Belief and faith play a major role in the book, and King raises a great many questions about the role they play in having power over each of us as individuals. Some instances of faith and belief can be good and positive, but others can be utterly destructive. Like most of us, each of the members in the Losers Club has a crisis of faith and this is when they become the most vulnerable to It. Through a back and forth narrative between 1958 and 1985, readers unravel the mysteries of Derry, the mysterious ritual that saves the town and is performed by mere kids, and are swept up in a journey that will leave them on the edge of their seats until the very conclusion. It by Stephen King is a fantastic read even the second time around. One of the best King has written. I read this is part of the Stephen King’ It Read-a-Long I co-hosted with Diary of an Eccentric. Please visit the more in-depth discussions for Part 1, Part 2, Part 3, Part 4, and Part 5. Anna and I are co-hosting the Stephen King IT Read-a-Long. We are having discussions once per month through the end of the year about the parts we’ve read. Each month you had the option to answer the questions on the hosting blog or in your own post, but please go back to the monthly host to leave your discussion link. Remember that these posts can contain spoilers. For the first discussion of part 1, plus the following interlude, go here. For part 2′s discussion, please visit Diary of an Eccentric. For the discussion of part 3, go here. Part 4’s discussion can be found on Diary of an Eccentric. Today, we’re taking a look at Part 5: The Ritual of Chud, the last interlude, and the epilogue. 1. Of the seven in the gang of Losers, which character do you believe is the direct opposite to the evil of IT and why? 2. At one point, Eddie talks about how he loves Bill and that Bill is loved, but wonders if that is too much power to have. What do you think he meant by that? And do you agree? 3. Forgetting is a theme in the novel, why do you think these characters forget or begin to forget once It has receded? 4. The turtle shows up in this section, but what is the turtle? theories about its purpose? 5. What are your final impressions of IT? Would you read another Stephen King book? Please leave your comments below. We can’t wait to hear what you have to say about the final scenes. Each month you will have the option to answer the questions on the hosting blog or in your own post, but please go back to the monthly host to leave your discussion link. The discussion for Part 4: July of 1958 and the interlude is at Diary of an Eccentric today! Come join us. The discussion for Part 4: July of 1958 was scheduled at Diary of an Eccentric for Nov. 30, but life events have intervened and we are postponing until Anna returns from her grandmother’s funeral. Thank you for your patience. Today is a discussion of Part 3: Grownups and Derry: The Third Interlude. 1. Like most towns, Derry has changed with more developments and banks, but to the “gang” some things remain the same? Do you think they are trapped by nostalgia or something more frightening? 2. The canal plays a prominent role, and as it runs through, around, and beneath the town it collects all of the waste and darkness from its sewers. What are your theories about the canal and its role in Pennywise’s cycles and mayhem? 3. The “gang” seems to have come together to work against the clown, and whatever they did is lost to their memories as they revisit sights that meant something to them in childhood. Chüd, silver dollars, and other items are mentioned. Was Mike’s suggestion that they spend time alone in Derry aimed at jogging their memories of what happened or was there another purpose? 4. Do you agree or disagree with Mike’s theory that after the “gang” stopped the killing cycle, something changed that allowed them to be more successful away from Derry than if they stayed? Why or why not? There are a few other questions that really don’t have answers at this point that I continue to ponder, such as what is Chud, what is this turtle, and how does IT know what these adults will fear most? Are their fears easier to gauge because of the connection they now have with IT since they put a stop to the previous cycle of murders? Or are these adults more connected to their childhoods than other adults may be — especially given some of their more creative jobs; doesn’t that require them to remain a bit in touch with their child-like selves? Please share your thoughts in the comments, and I’ll be sure to discuss with everyone. Thanks for joining in! For discussion of Part 4 and its following interlude, please stop by Diary of an Eccentric on Nov. 30. For part 2’s discussion, please visit Diary of an Eccentric today. For our 3rd discussion, we will be reading part 3 and the discussion will be hosted here on Oct. 31 in time for Halloween, but please visit Anna’s blog for today’s discussion. 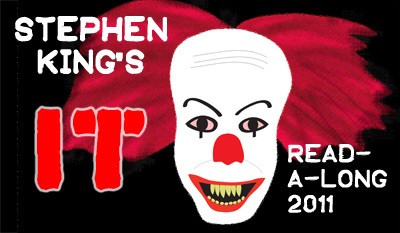 Welcome to the first discussion post for Stephen King’s IT Read-a-Long. I hope you’ve had time to read the first part whether it be in broad daylight or under the covers in the dark with a book light. Today we’re (Anna and myself, plus anyone else who plans on joining) going to talk about the first part of the book, plus the first interlude. I’ve read IT before, but at a younger age and the book scared me silly. However, it didn’t stop me from enjoying the horror genre or reading Stephen King books. I was excited when Anna agreed to a read-a-long of the book, because honestly I don’t think she would have tackled it on her own…simply because of the clown! I could be wrong though. Anyway, I started reading part one and it all flooded back to me and I was right there with old acquaintances in Derry, Maine. What is striking to me is how well King uses third-person omniscient POV. You get to see everything these characters are, have been, and wish to have been, and the fear they have of Derry and the promise they made is powerful. IT is described as a clown, but there is something darker and sinister about Pennywise — his yellow eyes and sharp teeth — and it seems as though he’s a metaphor for other things in the town, especially when you read about the homosexual bias and other hate that pervades the small town. Is he just a manifestation of the dark undercurrent of the town, or is he a real demon clown bent on killing children? Only time will tell. For some reason, beyond Stuttering Bill (Georgie’s older brother), Eddie has always been memorable. I think part of it has to do with his wife and how much she resembles his over-protective mother. But at the same time, his wife, Marty, is so dependent upon him. You feel him being pulled in two directions, between his childhood promise and his wife. One thing I notice now that I probably didn’t notice as a kid is the similarities between Bill Denbrough and Stephen King in terms of writing horror stories. It also made me wonder about whether King had similar thoughts to Denbrough about a teacher, or maybe an agent or publisher, who didn’t appreciate his writing. 1. Is this your first time reading Stephen King? If so, what have you enjoyed about the reading so far? How’s the writing? If this is not your first time, what’s brought you back to reading Stephen King? 2. What are your first impressions of the characters you’ve been introduced to so far? 3. Pennywise the Clown lives in dark places like the sewer, do you think he’s real? Scary? 4. How do you feel about the use of an Interlude between the parts? what purpose do you think it serves? Please feel free to pose your own questions in the comments. In September, on Sept. 28, we’ll be discussing Part 2, plus the interlude on Diary of an Eccentric. For the rest of the schedule, go here. Bring in the dark, the creepy, and the clowns! Yes, you heard me right. It’s time to begin the Stephen King’s IT Read-a-Long! Today marks the start of my read-a-long with Anna from Diary of an Eccentric, who is afraid of clowns. Anna and I will be discussing this book on our blogs for alternating months. And next month, on Sept. 28, we’ll be discussing part 2 on her blog. For the rest of the schedule, go here. How will you be reading IT? In broad daylight? At the beach? In the dark? Under the covers? Won’t you join us? Joyce Reardon and Stephen King’s The Diary of Ellen Rimbauer: My Life at Rose Red was the latest audio book selection of my husband for our daily rides to and from work. It is billed as a thriller or suspense novel, but I found that the diary format did not lend itself to suspense over the audio. I’m not sure if I would feel differently if I had read the hard copy of the book. The book begins with Ellen Rimbauer and her budding relationship with her future husband John Rimbauer, who is building a mansion to surpass all mansions in Seattle–Rose Red. The construction of the home is rittled in controversy as it is built on an Indian burial ground and contractors are killed on the site. Her marriage to John is wrought with marital turmoil as she continues to uncover the depths of her husband’s perversity and sexual desire. While the premise of the house being haunted is obvious from Ellen’s visits to psychics in Chinatown and the various disappearances inside the home, I was not scared while this audio book played, and I found it a bit predictable. The diary is entertaining until you get near the end when the supposed paranormal investigator, Joyce Reardon, interrupts the narrative to interject her reasons for eliminating portions of the narrative and to explain about speculation at the time of Ellen Rimbauer’s behavior after major events happen in the house, etc. Overall, this was a good book to listen to in the car and maybe to pick up and read, but it is not something that will frighten you. It is interesting to see how Ellen learns how to take control of her life with the help of her African handmaid Sukeena. If you have reviewed this book, feel free to drop me a link and I will add it to the review.